Our Buffalograss and Blue Grama mix behaves very nicely in a suburban setting, staying well under six inches high without mowing in most locations. The Blue Grama puts out these beautiful little "flag-like"
Lawn areas should start with a weed-free, smoothly raked seedbed. 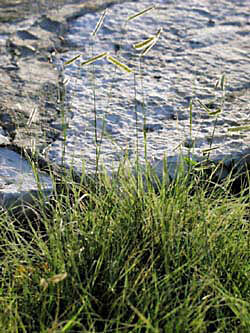 Reduce invasive perennial weeds such as Bermuda and Johnson grass prior to planting native grass. If you choose to use chemical weed killers, get advice from your county extension agent. Till the soil and remove the roots of existing non-native grasses and weeds if possible. But be careful - tilling too deeply can stir up dormant weed seeds, and create extra work for you in maintenance until the grass is so thickly established that it can begin to successfully keep out the unwanted visitors. For larger areas, plow several times before seeding to expose, freeze or dry unwanted roots. As an alternative to tilling lawn-sized areas, you can use an approach known as "solarization." This works best during the growing season, either in the late summer months or early spring when you expect a string of sunny days. It involves covering the area to be re-seeded with clear plastic (6mil thickness is best, though 4mil will probably do for smaller areas) and letting the sun and natural processes of nature do the work for you. Dig a shallow trench around the site perimeter, approximately 4-6 inches deep. Water the site thoroughly and deeply first. Then fit the sheets of clear plastic over the site and tuck the edges of the plastic down into the trench. Refill the trench to make the edges of the plastic secure. On larger areas it may be necessary to use several sheets of plastic and secure the overlaps with rocks or some other weight to hold them in place. You want to make it as "airtight" as possible and secure it firmly enough so that it won't get blown loose by the wind. You have now created a well-watered greenhouse, so that when the sun penetrates the plastic it will warm the soil and provoke more growth, including increased activity of natural soil molds and bacteria. When the unwanted vegetation is trapped under the plastic in these intense growth conditions and has nowhere to go, it essentially becomes compost. The whole process takes about 3-4 weeks when nature cooperates by providing enough sunny days. Once the process is complete, you can rake off the debris and compost it further. If there is not too much debris, it can be tilled into the soil as part of your seedbed prep. Most native grass seeds prefer 1/4" planting depths. Spread the seeds evenly across the area, and rake lightly to cover them. Firm the seedbed by rolling or packing the surface. Water the newly planted seeds lightly and frequently to prevent the top of the soil from drying out. When the grass is about an inch tall, decrease the frequency and increase the depth of watering. You can stop adding water once the grass is established. Larger areas will establish without irrigation, but obviously it helps if the planting is well timed with seasonal rains. If you're ready to take action in the fall, plant a cover crop of cereal rye grain. This is entirely different than rye grass. Old-time farmers used to cover crop their land before chemical fertilizers came along. By planting an economical, non-invasive crop, they could then plow it under to feed the soil. It's an efficient form of composting. Cereal rye provides lush green cover through winter and builds organic matter in the soil. 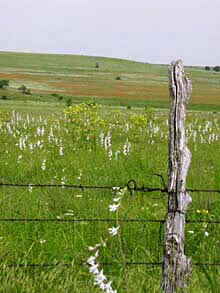 This cover crop fills the niche when fall planting is needed for temporary grass or erosion control.